Located in Cray Research's Technical Training Center this work references instruments of discovery and the process of the Cray founders. Reflecting components of the divided circle the work speaks to the spirit of exploration and discovery. Materials: Dyed and Painted Machined Aluminum; Colored Polyethylene, Phenolic, and Sintra Plastics; Neon Tubing. 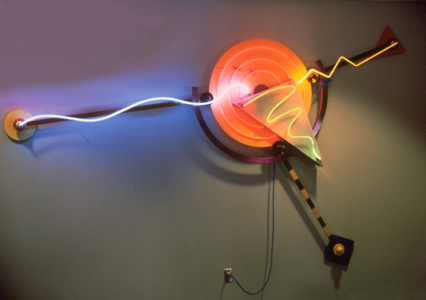 Activity: Flow Animated Neon Tubing.